On 10 January 1929, a young reporter boarded a train from Brussels to Moscow accompanied by his dog, Snowy. It was the start of Tintin's first great adventure and the beginning of Hergé's career. The Adventures of Tintin, Reporter for "Le Petit Vingtième", Tintin in the Land of the Soviets, was published as a book in 1930. That year marks the birth of a legend and the start of one of the most engaging relationships between fiction and reality, of the twentieth century. This adventure was issued in album form and the first 500 copies were numbered and signed by "Tintin et Milou". The first edition of this comic book is now very rare and costs a fortune! With the exception of a reissue in 1969 for the personal use of Hergé, again limited to 500 copies, more than forty years elapsed before this adventure was published again in 1973. Tintin, famous reporter with Le Petit Vingtième, departs for the USSR with his faithful friend Snowy. He is on a mission to find out, and report to his young readers back home, the state of affairs in Soviet Russia. This adventure was the birth of a legend and the first editions of the book have themselves achieved legendary status among collectors. From the outset, Snowy is there at his master's heel. Unusually for a dog however, he thinks and speaks like a human being, and comes to Tintin's aid time and time again. His loyalty and sincerity never fail to raise a smile. These pictures are notable for a simple yet amazing fact: they are the first and only time that Tintin the famous reporter is shown to be writing a newspaper article! Tintin's exploits, nevertheless, will become a kind of first hand reporting followed not only by readers of Le Petit Vingtième, but by millions of fans worldwide. From an artistic perspective, Hergé's drawings of Tintin and Snowy were still in embryonic stage, and would radically develop in future adventures. This first adventure also lacks any kind of plot, as Hergé improvised with relentless action scene after scene. Readers traverse Russia at breakneck speed on a rollercoaster ride of boats, planes, trains and automobiles. Animals play an important role in Tintin's adventures. 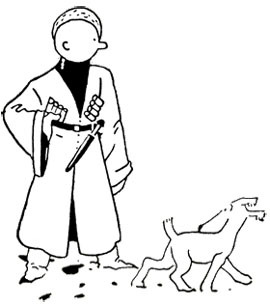 During an interview with the French writer Numa Sadoul, Hergé remarked. Keen readers of the first Tintin book will be able to spot certain scenes that Hergé would later enhance for other adventures. These frames illustrate this evolution of style between similar scenes from Land of the Soviets and Red Rackham's Treasure. Casterman delayed for a long time before publishing further editions of this story. They worried that although it was obviously historical, the views expressed in the story were somewhat dated, and it was set in an obscure era unknown to young readers. Nevertheless, later publications of this adventure would sell hundreds of thousands of copies. Tintin in the Land of the Soviets is the only one of Tintin's adventures which has been published with a page missing!Browse a modern copy of this book and you'll notice a page missing between pages 101 and 102. Not to worry, as we've reproduced it here for your inspection! This elusive page was included in the original publication of the story in Le Petit Vingtième, but was left out of the 1930 book edition. Tintin in the Land of the Soviets should not really be considered part of the series. It is more of a 'proto-Tintin' with a very different formula. It's good there has been no attempt to colorize it - simply would not work.